Concentrating on the urban landscape, these recent works capture atmospheric moments of city life. With a strong sense of perspective, light and shade the compositions hold a certain restlessness reminiscent of Edward Hopper. This show represents Marc’s love of Hackney (a resident for 15 years) and its surrounding areas, with both familiar and unfamiliar views. Capturing the singular beauty to be found in those neglected buildings that have fallen into disrepair as the living city of London continues to evolve around them. Marc has exhibited alongside The East London Group of painters whom he shares the ethos of finding inspiration on your doorstep - to paint what is around you. "I had always set out to paint the city I knew and which is close to my heart. Avoiding the repetitiveness of London's landmarks depicted in many paintings my aim was to capture an alternative view of the city. As much as I love the monumental buildings that create our skyline, it is the side streets and alleyways that hold a mystery for me. I began to explore the streets of East London discovering something new and magical each time. The street corners would appear as cinematic compositions. I was able to visualise them from reality to canvas." As the face of London changes overnight, it's apparent that these views of the city, the architecture of crumbling and faded grandeur are beginning to vanish before our eyes. Desolate buildings, with their peeling paint, numberless front doors, and glimpses into empty rooms through uncurtained windows invite contemplation, of the lives once lived here, and the new lives that continue to do so. 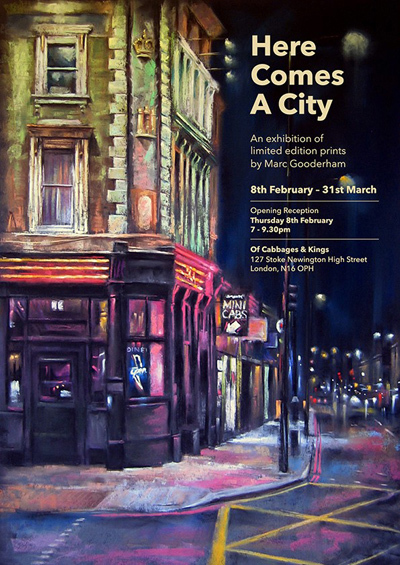 Marc Gooderham’s work is also featured in the recent Spitalfields Life publication East End Vernacular – Artists who painted London’s East End streets in the 20th Century.